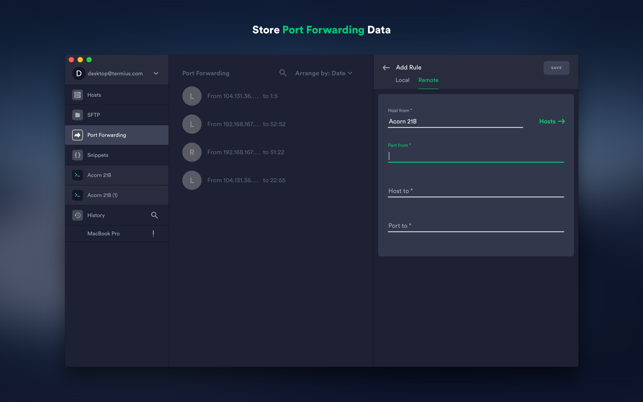 · Port forwarding lets you encrypt nearly any service or connection. · One subscription covers all your mobile and desktop devices. · Protect your account with two-factor authentication. Having a single window app with multiple SSH connections running at the same time is huge. Storing credentials to make connections easy is incredible. I really wish I had this years ago. 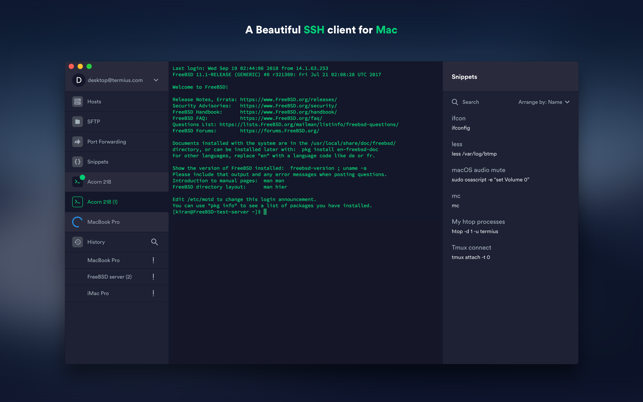 I actually enjoy my SSH sessions in this application where using the normal mac terminal before made me hate managing linux servers. I also really like that I can’t accidentally command+Q and close the app if I have one or more open sessions. I’ve closed terminal windows so many times by mistake that I could scream if I did it again but it won’t happen in this app. 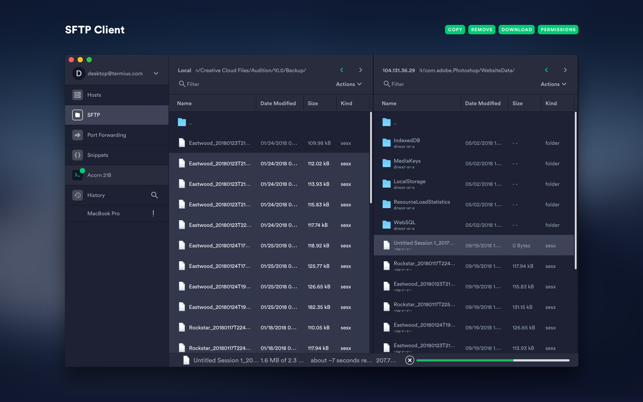 - I wish the sort order of hosts was a configuration, it defaults to date and if I change to name, close and reopen the app, it is back to sorting by date. 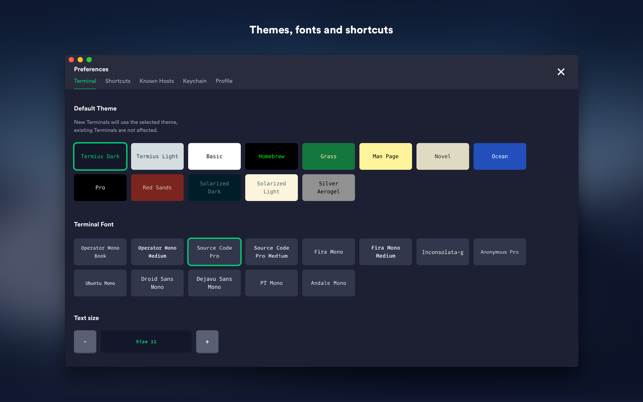 - I wish I could created a custom color scheme, even though the list provided is very good. 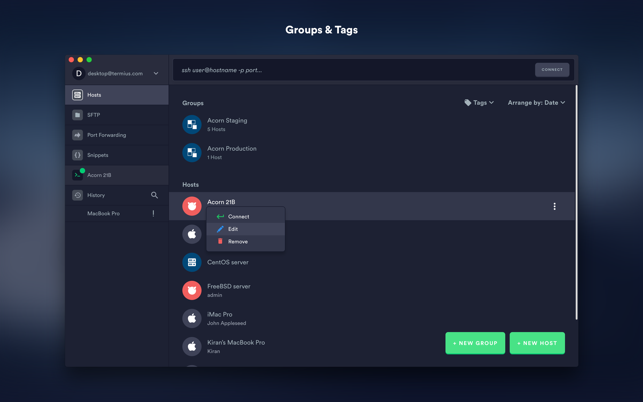 - I wish I could pin hosts to the left menu. - I wish it included a way to create macros I could execute in the SSH session, such as a shortcut that would paste commands I use often. Regardless of my wish list, this is still the best SSH client I’ve used on any platform! 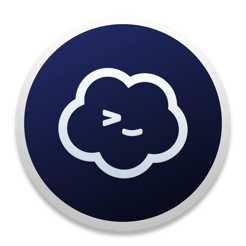 Im totally kool with this app and is helpful to configure all my Unix Servers and access it in one click away . But Iam the developer who works in black screens and in this app , if I set up black screen, Im losing the view of my trackpad cursor .To explain precisely , if I change the screen terminal to black, I would need my cursor to change to white or some other color to track easily. But here everytime, I need to come out of the screen to locate my cursor and go back to the terminal for selecting any texts. Am I missing any settings or is this something that can be fixed in the software itself may be in the next upgrade? Thank you!!! 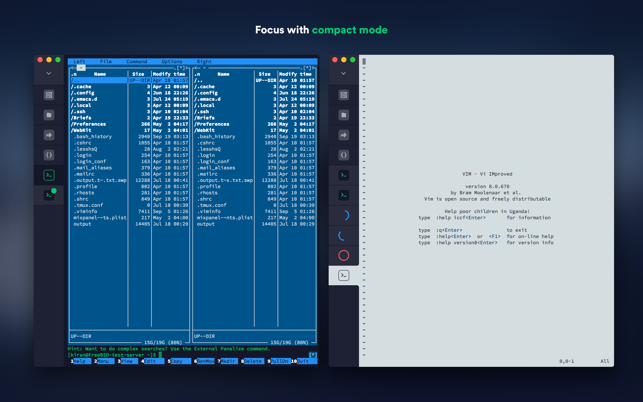 I’ve been looking for a low cost SSH terminal client that is clean, minimal, and functional. I downloaded this app yesterday and tested it for random connections without any issues. Today I added my servers to memory with my private keys. I am very impressed with this free little app. It looks good and functions very well for me. I’m not saying this has all the bells and whistles as my ~$100 SSH client but it just works as expected. This is definetly going to be my “go to” SSH terminal from now on. I’m very impressed so far. Thank you for this wonderful app.